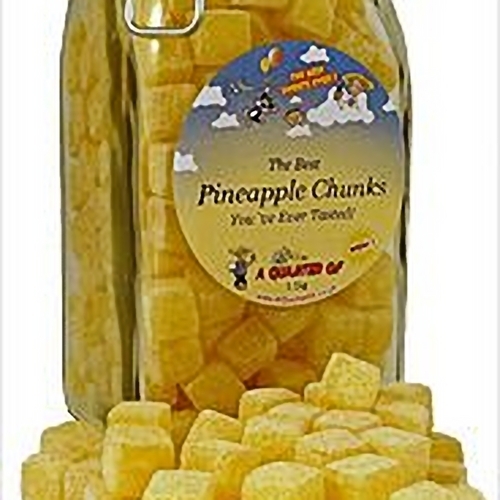 The Best Pineapple Chunks in a Kilner Jar: Order online now! The Best Ever Pineapple Chunks in a Kilner Jar - A stunning (and very useful afterwards!) glass kilner jar filled to the brim with the best Pineapple Chunks we've ever tasted. That's because we have refined the recipe over and over again, and had them made especially and exclusively for A Quarter Of. You won't find them anywhere else! Each individual Pineapple Chunk is a work of art, and is packed full of flavour.... even the little zingy crystals covering each juicy chunk are packed with pineapple flavour (i.e. it's not just sugar!) - so we think you'll agree that the flavour is simply amazing (just how you remember it). So, if you know anyone with a serious Pineapple Chunk weakness, this is THE perfect gift for them!